In this lesson we will see how to write a custom function that gives the ceiling of a number. Update Note: In LiveCode 7.1 onwards, LiveCode has its own built-in "ceiling()" function. As such, the following lesson applies only to LiveCode versions earlier than 7.1. The function returns the ceiling of the given parameter pNumber. The ceiling of a number is the smallest following integer, more precisely ceiling(x) is the smallest integer not less than x.
put ceiling(it) into field "Total Price"
For this lesson all we need is an entry field and a button to call the ceiling function and return the result. The first thing the custom function must do is check that it has been passed a number, if the pNumber parameter passed to the function is not a number the function will return an error message. However, if we truncate the number(to get its integer part) and then add 1, we do get the desired result. By truncating 2.4 we get 2, add 1 and we get 3, the desired result. Are we done? Not quite: there are two cases where this formula does not produce the ceiling number. 1 - If the number is already an integer, it is its own ceiling, so we don't want to add 1 to it. 2 - if the number is negative and not an integer, the above doesn't give us the ceiling. For example, the ceiling of -3.6 is -3, but truncating -3.6 gives -3, adding 1 gives us -2. 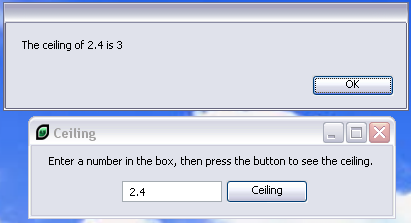 In both these cases the truncating gives us the ceiling of the number, without having to add 1. Luckily for us LiveCode has a built in trunc function which returns the integer part of a number so we can use it in our custom function. return "Error: not a number"
Can you tell me how I can format a field so that it only has 2 decimal places? you can format values for a field by using the "format" function. You can find further information on this in the LiveCode Dictionary. Could not find in dictionary as I was looking for "number", or "decimal", or "round". Now that you pointed out "format" I was able to find in dictionary, BUT still unable to get it to work. Where do I put this line of code? set the numberFormat of field "Miles" to "0.00"
I tried to put the code in the field "Miles" script but it didn't seem to work, and not sure what handler I should use. I also tried this line of code in the card script within the preOpen Card handler but this did not work either. In other apps on my android, when I press numbers, the keyboard stays on numbers until I change it by toggling back to alpha. How can I tell the app keyboard that the field is "numeric" and to stay on the numbers (until I toggle back to alpha)? it really depends on how you want to process the field data. You can implement code that waits until the user has entered the data and then process the content entered, or you can test the data entered each time the user selects an entry. filter tFieldData with "[0-9]*" & "." & "[0-9]*"
answer "Only input floating point numbers"
You will have to tweak the code to what you need and will probably want to replace the dialog box bit with something that removes unwanted characters. I tried your example code above and it did absolutely nothing. I tweeked it changed it - everything, but still my field came out with several decimal points. (I didn't even get an error message). Perhaps if I explain what I am doing? It is so very simple, the answer shouldn't be so complex. I have a button called "calculate" When I click on calculate, the "answer" appears in the "answer" field. I would like the "answer" field to round off the answer to only show 2 decimal points. So, what handler do I use, what script do I put it in, and what is the code? Please help because I just can not figure this one out! sounds great, but again, what handler do I use and what script do I put it in? I tried putting it in the preOpen Card because all the entry fields are numeric, but that didn't work. the reason the code did not work is probably because it was not placed in the field script. You can put a breakpoint in the code and see if you hit the breakpoint when executing the code in the IDE. If you do not hit the breakpoint, then the code is not being executed. put myResult into field "answer"
"answer" is the name of the filed that is to receive the value. The two lines here can go into the handler that processes the button click. This is probably a mouseUp handler. The command for setting the keyboard type should be called before the keyboard is launched. Apart from that it does not matter from where it is called. For testing purposes on a device, you can add an "answer" dialog after a particular command/function, to see that it was called. answer "Keyboard set to numeric" with "Okay"
Once you know that the dialog pops up, you also know that the keyboard setting has changed to numeric. Later remove or comment out the "answer" line, as you then know that mobileSetKeyboardType "numeric" was called. set the numberFormat of me to "0.00"
would work in the script of the field "Miles", perhaps triggered by a closefield handler. The numberFormat is not a field property so cannot be used in this case.